Shotcreting. Works. Shotcrete mixture. Sales. ГлавнаяShotcreting. Works. Shotcrete mixture. Sales. Do you need professional and prompt shotcreting at an affordable price? Take our offer, and you will not regret it. We are prepared to develop an individual design for you. In our work we strictly comply with the existing technological norms, which makes it possible to guarantee high quality of all services rendered by us. Clay; plaster; concrete and other materials. to thoroughly fill small pores, cavities and cracks. It has to be noted that shotcreting can be used for treatment of concrete walls, as well as various floors and coverings. This technique makes it possible to enhance the structure’s durability, resistance to a number of negative factors, among which are mechanical impacts, climatic changes and excessive humidity. Shotcreting makes it possible to form a dense layer of concrete which tightly adheres to vertical separations. The obtained coating boasts excellent frost-resistance and waterproofness. Besides, shotcreting helps improve physical and mechanical properties of concrete, making it more durable and enhancing its quality. If you have any questions in regard to shotcreting, our consultants will be only too glad to assist you. Our specialists will provide you with all the necessary information and help you to place an order. 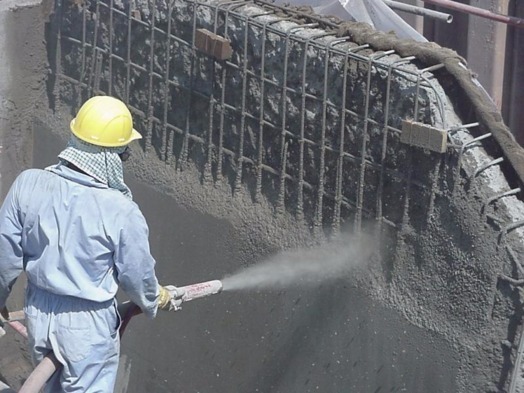 Shotcreting, or concrete spraying is a relatively new, but widely used method of reinforcement of structures and buildings. We sell high quality shotcrete mixture for shotcreting – Torkretbeton. The material obtained in the result of shotcreting is called Torkretbeton. The basic equipment for shotcreting is the shotcreting station consisting of a shotcrete gun, or concrete grouter and an air compressor. There exist two main shotcreting methods using shotcrete mixtures: dry and wet ones. With the dry method, the concrete mixture is brought to the nozzle of the working equipment where it is mixed with water which is supplied through a separate hose. Then the ready-made mixture is sprayed under high pressure and at high speed onto the treated surface. With this type of shotcreting, thickness of the layer is approximately 15 mm. Wet shotcreting is also called pneumatic concrete pouring. The ready-made working mixture is brought to the nozzle and then sprayed onto the treated surface. In this case special pneumatic concrete pumps are used which make it possible to perform shotcreting of surfaces continuously and uniformly. -other additives and fillers – to give the coating certain mechanical or operational properties. • Reinforcement of various natural slopes and ramps. • Erection of vertical thin-walled reinforced concrete structures. Protection of structures against the impact of aggressive environment, protection of refractory and acid-proof coatings made of special concrete in metallurgical industry; restoration of bridges, hydraulic engineering installations, construction of swimming pools, etc. Our company executes works of any level of complexity connected with shotcreting. We have our own state-of-the-art equipment which allows us to execute any works in any conditions at any locations promptly and with high quality. Our mobile team is ready to come to you and execute your order.